Angel Kiss Set - Milk & Honey £11.90 (SALE £8.30)* If smell-o-vision were a thing, you'd be drooling right about now. 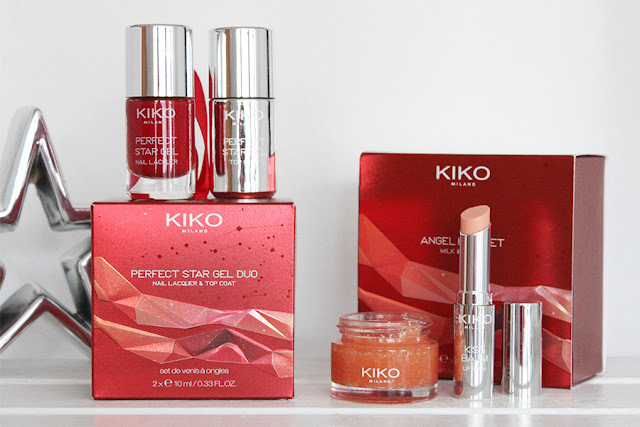 The KIKO Angel Kiss Set includes two milk and honey scented products; a scrub and balm - the must have winter survival kit for your pout! The duo smell delicious, like a freshly opened pot of honey and are presented in a festive red gift box, inspired by the star constellations. The exfoliating lip scrub is packaged in a glass jar with a mirrored lid (pretty). And the scrub itself is made with sugar crystals, with a formula boasting protecting and nourishing ingredients such as rosemary and jojoba oil that leave my lips feeling super smooth. The milk and honey scented Kiss Balm is also encased in elegant mirrored packing and has a formula enriched with potent plant-based active ingredients including Shea butter that smooth, moisturise and protect the lips. The lip scrub and balm duo is available in four scents: Candy Canes, Champagne & Strawberries, Milk & Honey and Cranberry Crumble. Perfect Star Gel Duo Nail Lacquer & Top Coat £7.90 (SALE £5.50)* If you're after a new nail polish set, the Perfect Star Gel Duo Nail Lacquer & Top Coat are a steal at just £5.50. The set is packaged in the collections signature red box and includes a colour and top coat with a gel effect finish. I have the set 'Intuitive Red' a classic holiday red with subtle micro glitter particles. The colour applies evenly and the finish is super glossy. Overall I was very impressed with the quality of these polishes and would happily purchase another. The Perfect Star Gel Duo is available in four colours: Translucent Beige, Intuitive Red, Artistic Plum and Spontaneous Pink.